These stainless steel braided flexible hoses have an EPDM polymer tube, making them ideal for time saving installation of HVAC equipment and other industrial type applications. They are designed for use in water, glycol, or other EPDM compatible systems, such as fan coils or heat pumps. They are not suitable for gas, or for any petroleum based products. These flexible hoses are not suitable for vacuum applications. The standard end fitting configuration is Male NPT x Female NPSM. A wide variety of adapters are available to suit your needs. We also offer a 100% domestic coil hose. This hose comes standard Male NPT x Male Swivel. 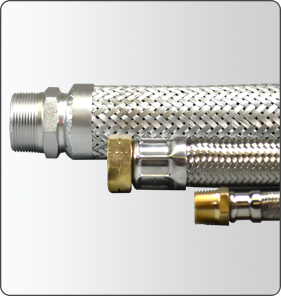 The all metal construction on this hose allows it to be used in a wider range of applications.